Howard Tayler is the writer and illustrator behind Schlock Mercenary, the Hugo-nominated science fiction comic strip. He has written SF horror for the Space Eldritch anthologies and Shadows Beneath, and full-metal fantasy tie-in fiction for Privateer Press. With Alan Bahr and Sandra Tayler, Howard created The Planet Mercenary Role Playing Game, which included well over 100,000 words of world building. His most recent printed work is Force Multiplication: Schlock Mercenary Book 12. New readers may find Random Access Memorabilia, which is available to read free online, to be a delightful introduction to the work for which he is best known. Howard is a student of humor, and believes that “funny” is a thing which absolutely can be learned and improved upon. 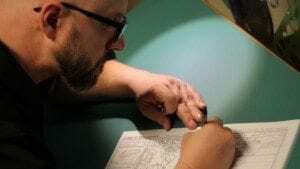 He’s an advocate of focused practice, and praises artists’ skills, rather than saying “you’re so talented,” because he knows that their years of study and refinement are what we see on the pages they create. Howard lives in Orem, Utah with his wife Sandra, their children, and one ungrateful, archetypally imperious cat.